Peter Dean and Ken Gleiman’s recent paper Beyond 2017: the Australian Defence Force and amphibious warfare  is undoubtedly timely: first, because policy that will shape important decisions to be made within the ADF is expected in the form of the Defence White Paper; and second, due to the amphibious capability approaching operational certification. Also welcome are contributions here on The Strategist by Albert Palazzo  and Michael Clifford. Fundamentally, both argue that policymakers must decide what the amphibious capability should look like. Equally, they allude to the implicit uncertainty with regards to the way in which the ADF will ultimately operate the big ships. Despite the often chaotic, perhaps even emotional, debate on amphibious capability, we all know that a government or ADF decision on amphibious capability represents no boundary to its actual use. Furthermore, the assumption that we can be definitive about it belies the actual challenges that the ADF will face in integrating training, personnel requirements, equipment and other factors that will emerge after the capability is declared operational and lessons are learned from its actual use. This isn’t an especially unique problem facing the amphibious capability, but is echoed in other programs such as Army’s modernisation of its command and control systems under ‘digitisation’. That there’s so much debate on the capability today reveals how challenging it’s been for the ADF, if not commentators, to rationalise its direction, let alone to coherently enunciate Australia’s approach to the execution of maritime strategy . To avoid treating this capability ‘skin deep’ we need a sense of military history and a prediction of strategic requirements, and we need to properly amalgamate strategic policy, adapt doctrine and concepts and appreciate what’s practically achievable, all while being mindful of funding and time constraints. Even with those factors at the forefront, it’s still too much to expect senior military leaders to have the prescience to correctly foresee Australia’s future conflicts and contingencies. As readers of The Strategist know too well, we can’t predict the future. In a more practical sense, the best outcome for the capability as a consequence of these decisions is one in which meaningful capital investment eventuates to support functions such as land logistics, aviation, littoral watercraft and other elements often forgotten in arguments fixated upon ships and the work of the 2nd Battalion at the capability’s core. However it seems more likely, given the current policy environment and resource constraints, that the ADF will only credibly achieve an amphibious capability that can logistically sustain and execute relatively small commitments at the lower end of the conflict spectrum. In a debate prone to ‘faddism’ that routinely overshoots what’s practicably deliverable given existing means, it’s imperative that when it comes to capability development that the basics aren’t overlooked for want of more ‘icing’ on the ‘cake’. But this isn’t to say that the ADF shouldn’t do the best it can to prepare for the biggest challenges it may face; combat intensive amphibious warfare against a capable adversary. Preparing for even the most unlikely scenarios is a fair expectation of anyone to have of a credible military force—even if resources aren’t forthcoming. Nor should we excuse the government for its part in defining key strategic requirements that drive capability choices in Defence. However it does suggest that it will be important for the ADF to plan, develop, train and exploit opportunities and understand constraints of what’s actually possible and practically achievable with what’s on hand. After all, the only thing military leaders will have real control over when Government asks the ADF to respond to a crisis is an enunciation of what the amphibious capabilities’ limits are, and what operational options might be possible at that point of time. 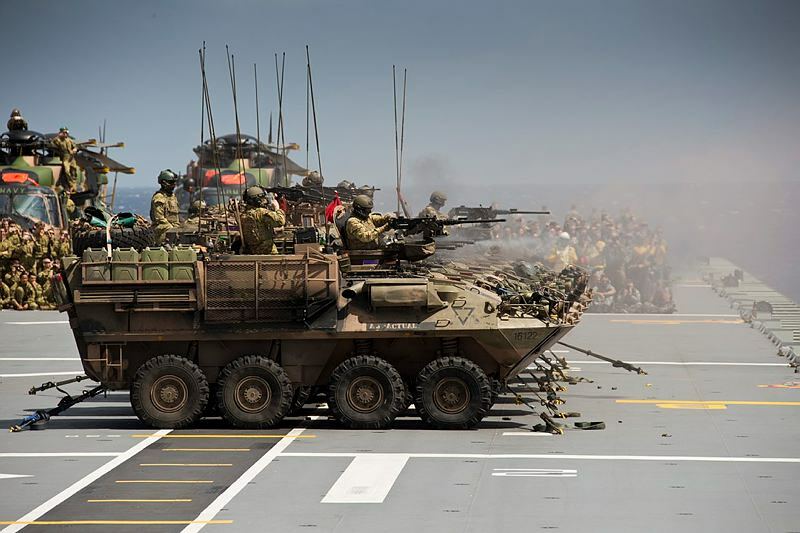 Whatever the next Defence White Paper states, and whatever the leaders of the ADF decide upon as a consequence, I argue we are really at the beginning of uncovering the practical usefulness of a modernised 21st century amphibious capability. Integrating the capability into the ADF will largely be a voyage into the unknown—it will expose numerous capability gaps and limitations in the joint force as Beyond 2017 alludes to. Quite clearly this means we must be pragmatic when it comes to the expectations we might have, if not the actual potential, of this capability. Government and policymakers have major, costly commitments to make to empower the ADF to develop the amphibious capability to its full potential. In turn, ADF leaders must also articulate clearly their own intentions; an obligation now well due given the near two decades of trialling and experimentation, and a number of major regional expeditionary operations that can inform them. But it’s likely to be the practical experiences of coming years that will prove to be the most vital factor in establishing confidence in the ADF’s amphibious capabilities and determining what is operationally achievable—irrespective of whatever choices are made in 2017. The real challenge for the amphibious capability is yet to come as we move from the mud of strategic decision making, into the potential quicksand of actual manifested capability generation. David Beaumont is a serving Army officer and undertaking PhD research at the Australian National University. The views expressed here are his own and do not necessarily reflect those of the Australian Army, Department of Defence or the Australian Government. Image courtesy of Department of Defence.